Click the image to view at full size. Click any name below to learn more. The Leadership Team, comprised of the funding partners and residents, is responsible for maintaining the initiative structure and serve as champions/spokespeople. The Community Engagement Council consists of committed residents aged 60 or older (or their caregivers) who geographically represent the County’s aging population. 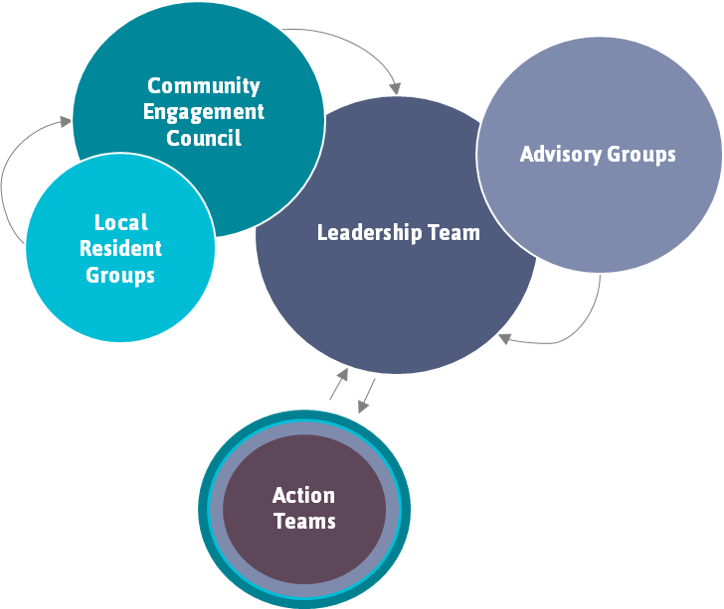 The Community Engagement Council will help drive initiative work, as well as be a bridge to community members through local resident groups, which include existing community volunteer groups and residents who would like to be involved. Issue-specific action teams comprised of residents and organizational representatives will ultimately be built around the six focus areas. Action Teams will be responsible for making data-informed decisions around priorities and action. Advisory Groups include the faith-based community, as well as the Aging Services Planning Committee. Once the structural components of the initiative are in place, the process of work within the service system includes first identifying a priority area. The priority area must be data-informed, momentum-building, that are inclusive and extend beyond the status quo. 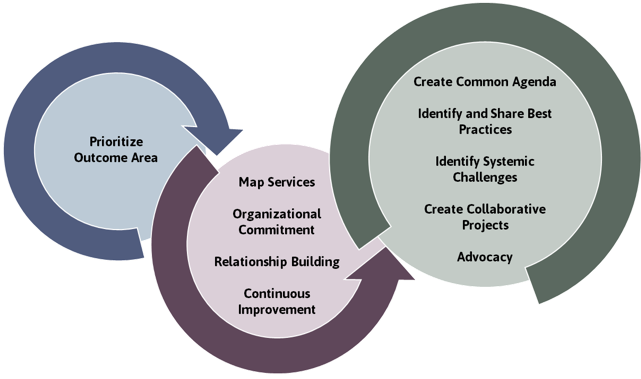 Once a priority is identified, associated services will be mapped out to identify any gaps. Because organizations may have to adjust existing programs or make changes as part of the continuous improvement work, on-going collaboration and relationship-building is essential. In identifying service gaps, best practices will be identified and shared across organizations, collaborative projects will be created- culminating in advocacy and development of a common agenda- the community plan.